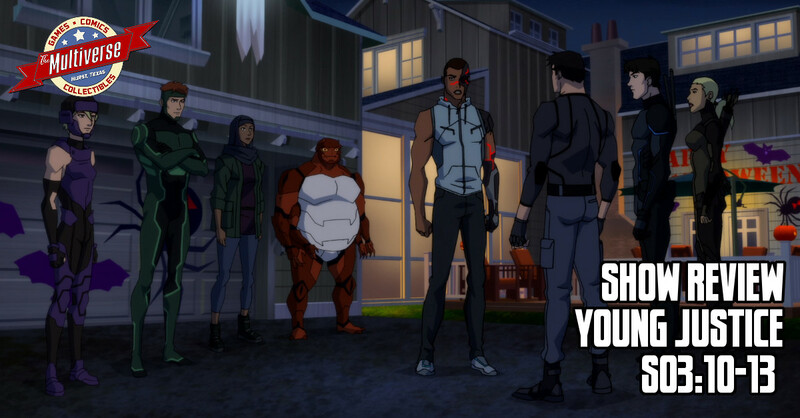 The final four episodes of the first half of Young Justice: Outsiders are the perfect capstone for a mini-season that was everything fans could have hoped for and more, after years of waiting and wishing and waiting and hoping and waiting and praying. And then waiting some more. It was all worth it in the end though. And while we’re going to have to wait five months for the second half of Young Justice: Outsiders (which is due to be released in June) we can take comfort in the fact that at least this wait won’t be as long as what we’ve endured so far. Episode 10, “Exceptional Human Beings,” sees Batman, Katana and Metamorpho conducting a raid on the island nation of Santa Prisca, searching for details on who is now running the League of Shadows in the wake of Ra’s Al Ghul’s abdication. Meanwhile, in Detroit, a young man named Victor Stone is despondent that his father, Dr. Silas Stone, is more interested in a piece of technology called a Fatherbox than his success as a student athlete. This episode is a bit of an odd one, as the Outsiders themselves take a backseat to introducing the boy who will become Cyborg and the action of Batman and his team investigating a League of Shadows stronghold. It’s still enjoyable but a little odd as we barely see the regular characters apart from some brief scenes of them training and Artemis helping Halo register for school. The mix of scenes is eclectic but not off-putting. Besides, you can’t go wrong with a Batman vs. Bane fight, especially with Danny Trejo as the voice of Bane. Episode 11, “Another Freak,” sees Halo and Forager starting their first day of school at Happy Harbor High. Meanwhile, halfway across the country, a laboratory accident leaves Victor Stone seriously injured and his father making a desperate choice. It will surprise no one that Victor Stone winds up getting transformed into a half-man/half-machine Cyborg by the episode’s end. What’s surprising is that the show did it after only introducing him an episode earlier. Scott Snyder fans may want to check out this episode, as it features a cameo appearance by Harper Lee (aka Bluebird) as the punk girl who is the only person who tries to befriend Halo and Forager. Episode 12, “Nightmare Monkeys,” is largely focused on Beast Boy, who finds himself in a surreal nightmare after trying out a pair of Goode Goggles – the hot new VR toy that’s sweeping the nation. At the same time, the Outsiders come to a realization about Halo and the true source of her powers. Again, the serious plot stuff involving one our main characters largely takes a backseat to the weirdness of Beast Boy’s dream quest. Thankfully, these sequences are hilarious and include some truly wonderful parodies, including a scene that details Beast Boy’s time in the Doom Patrol while parodying Teen Titans Go! Naturally there’s a goofy musical number which undercuts the fact that the Doom Patrol died horribly and left Garfield Logan orphaned a second time. The 13th episode, “True Heroes,” tackles the other big mystery of Young Justice: Outsiders – what happened to Princess Tara of Markov? The action here is largely focused on the rescue attempt to recover Tara, as things come full-circle with the first episode, as the team goes on a covert mission to break up a metahuman slavery operation in a hostile foreign country. In the press-tour leading up to the release of Young Justice: Outsiders, executive producer Greg Weisman confirmed that the third season of Young Justice would be “PG-13, toward R” in terms of its content. The final four episodes of the first half of the season confirm this, with there being a lot more blatant innuendo than in the first two seasons and some increasingly gory animation that would push the limit of a TV-14 rating if this were on a traditional broadcast network. I mention all this to impress the fact that despite having started out as a Saturday Morning cartoon, Young Justice: Outsiders is no kids show. The adult content and violence is not included for pure shock value, however, and is merely set-dressing for the equally mature and nuanced writing. The level of detail in the scripts and the animation is truly astonishing and half the fun of this show lies in all the little details that tell you things about the characters without a word being said. Case in point: Deathstroke uses a “dad phone”. I know this is an incredibly silly point to get hung up on, but I just love this little detail because it makes a weird amount of sense. Slade Wilson’s an old-school kind of guy who doesn’t waste time with flashy toys or gimmicks when a simple sword stroke can get the job done. It also makes sense when you consider that one of Slade’s business partners is literally brainwashing people through their video game systems and Slade’s definitely paranoid enough to not take chances on anything more advanced than a TracFone doing the same to him. I’m not going to bother rating the individual episodes this time around. They’re all fantastic in their own ways. With the possible exception of Legends of Tomorrow, I don’t think any show has ever quite captured the sheer variety of the DC Comics universe quite as well as Young Justice. If you have yet to subscribe to DC Universe, this show alone is well worth the investment. Young Justice: Outsiders will return in June on DC Universe.